One of the most acclaimed stage actors of his day, Otis Skinner appeared with Helena Modjeska and Edwin Booth in "Much Ado About Nothing," "Richelieu," and "The Fool's Revenge" in 1889. But it was as Hajj, the rascally beggar in "Kismet," that he became most famous. Taking the role to the screen first in 1920, he brought it to further life in this, the talkie version of 1930. The story centers around Hajj pleading for charity on his stone perch before the mosque. A scoundrel of great ability, he absconds with a purse of gold from the notorious "White Sheik," who turns out to be an old enemy of his. Meanwhile Hajj's beautiful daughter, Marsinah, (Loretta Young) is in love with a young man (DM) who occupies the adjoining house. Posing as the Caliph's gardener's son, he is really the Caliph Abdallah himself. Through intrigue Hajj becomes embroiled in palace politics and eventually, albeit reluctantly, attempts to murder the Caliph. Being cast into the "death-dungeon," Hajj is eventually freed and, after revealing his true identity, the Caliph and Marsinah prepare for their wedding. Hajj, however, returns to his beloved begging stone outside of the mosque. The scenes of Kismet are laid in the streets, mosques, palaces, and seraglios of Baghdad and as the program states, "The camera catches the full sweep of Kismet's drama and oriental magnificence." Filmed in experimental 65 MM wide screen and utilizing early Technicolor, no print or negative of Kismet exists and it is therefore considered a "lost" film. 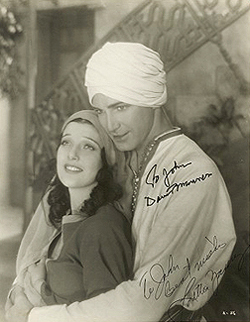 Purchase Kismet (the 1920 film version with Otis Skinner - 10 years before the Otis Skinner / David Manners version) in DVD format through this Amazon.com link and a portion of the sale goes to the David Manners web site. Help support this site with your purchase.